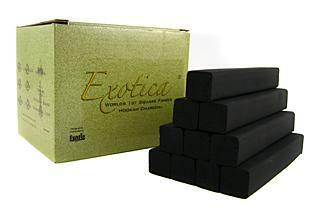 Exotica Square Finger Coal is the first natural charcoal in the shape of a square to be offered on the market. Exotica Coals are designed in a square shape so they do not leave a lot of ash and to prevent the charcoal from rolling off the top of your Hookah Bowl. Exotica Square Finger Coals are natural and do not contain any quick lighting chemicals, being primarily used by either avid Hookah smokers or Hookah Lounges. 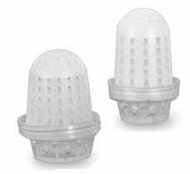 These charcoals are specifically designed for Hookah smoking, as they are odorless, tasteless, do not contain any chemicals, and do not crack. Exotica Square Finger Coal is available in a 1 kilo (2.2 pounds) box, and it is recommended that you break the charcoal squares into smaller pieces (not more than 1") and heat on an electric stove or open flame before every smoke. Package Deal Offer: This product is part of a package deal offer. To qualify for this package offer and receive the discounted price, you must purchase a minimum of three boxes of Exotica Square Finger Hookah Charcoal. To view the non-package deal product, click here.